Frank Zappa, who sang about "Plastic People," has been cast in bronze. Again. In 1995, a quirky bunch of Lithuanian artists and intellectuals managed to erect a bust of the eccentric rocker in downtown Vilnius, the capital of the former Soviet republic. 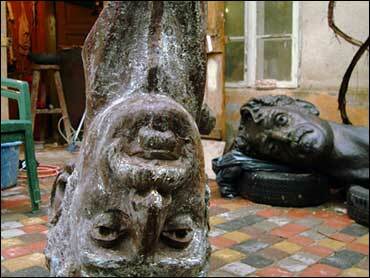 Now, they want to place a replica in Zappa's hometown. Saulius Paukstys, longtime president of a Zappa fan club, was in Baltimore on Wednesday to pitch the Zappa bust to the city's public art commission. "It's carved already, and it's ready to be shipped to the U.S.," said Arturas Baublys, a public relations consultant and Zappa admirer who made the trip with Paukstys. "Whenever Baltimore says, 'OK,' and gives us an address to ship it to, we pack it and we ship it on our costs. And that's a nation of three and a half million giving a present to the United States." Before the initial sculpture was erected, there was no known connection between Zappa and Lithuania. The mustachioed, antiestablishment musician was born in Baltimore to an Italian immigrant father and died of prostate cancer in 1993 at age 52, never having visited the Baltic state. But his music was popular among the Lithuanian avant-garde, particularly in the immediate aftermath of the country's independence in 1990 from the Soviet Union. Paukstys, an art photographer, launched the fan club and even set up an art exhibit with imagined correspondence between himself and Zappa, whom he had never met. The club commissioned the bust from Konstantinas Bogdanas, a respected sculptor who cast many portraits of Lenin during the Soviet era. And members managed to persuade the mayor and city council to place it in a public square, in front of the Belgian embassy. "It was just four years after independence," Paukstys said through Baublys, who translated from Lithuanian. "The opportunity for this Zappa statue was also like a trial for the new system and the newly established democracy, if that (was) possible or not." Paukstys and Baublys hope for a similar friendly response from Baltimore, where last year Mayor Sheila Dixon proclaimed Aug. 9 as "Frank Zappa Day." Vilnius Mayor Juozas Imbrasas sent a letter to Dixon asking her to accept the gift. "I hope that replication of the original statue of Frank Zappa in Vilnius and bringing it to Baltimore will perpetuate the memory of one of the greatest artists of the (20th) century," Imbrasas wrote. Baublys estimated the cost of creating and shipping the bust at $50,000. The city would be responsible for installation and maintenance at a yet-to-be determined location. He said the project has the blessing of Zappa's widow, Gail, who as head of the Zappa Family Trust has been protective of her late husband's image and music. Gail Zappa's attorney did not immediately respond to an e-mail seeking comment, and an agents for two of Zappa's sons, Dweezil and Ahmet, did not return phone calls. Sterling Clifford, a spokesman for Dixon, said the mayor had no objection to the bust but would defer to the judgment of the public art commission. He noted that Zappa belongs in the pantheon of Baltimore's famously offbeat favorite sons and daughters. "Like John Waters and a lot of artists we're proud of," Clifford said, "it's a big deal that Frank Zappa is from Baltimore."